Raven Rock State Park sits along the fall zone, an area where the hard, resistant rocks of the foothills give way to the softer rocks and sediments of the coastal plain. The underlying rocks of the area were formed more than 400 million years ago by intense heat and pressure. Through the ages, flowing waters and swirling winds gradually eroded the land, carving and sculpting Raven Rock. This immense crystalline structure rises to 150 feet and stretches for more than a mile along the Cape Fear River. Indigenous peoples, Siouan and Tuscarora Indians, lived and hunted in the area until the arrival of Europeans in the 1700s. Early settlers, many from Scotland, lived by hunting and trapping along the river. The rock was originally called Patterson's Rock for an early European settler who found refuge there when his canoe capsized nearby. In 1854, its name was changed to Raven Rock, inspired by the sight of ravens that formerly roosted on rock ledges. Later, stores, mills and quarries were built. Many of the woodlands were farmed, and as the forests returned, much of the land was harvested for timber. A road that stretched from Raleigh to Fayetteville crossed the Cape Fear River via the Northington Ferry and served as the area's major transportation route. Locks and dams were built along the river to facilitate navigation by boat, and Raven Rock became an important landmark for river pilots. After a hurricane destroyed the locks and dams in 1859, the structures were not replaced; railroad transportation eliminated the need for river travel. As new roads were built, the ferry was closed and Raven Rock became a popular recreation spot. The remnants of the Northington lock and dam can still be seen in the park. Simultaneously, local support for the acquisition of Raven Rock was being organized by Dr. Robert Soots, a Campbell College professor. After hearing about the possibility of the land being sold to either a mining or paper company, Dr. Soots accellerated his efforts by presenting a proposal to the Harnett County Board of Commissioners, recommending that Raven Rock be preserved as a state park. The Board supported the proposal, and also requested that Dr. Soots coordinate the Raven Rock project and represent the County in a presentation to the North Carolina Board of Conservation and Development. On October 28, 1968, Dr. Soots appeared before the State Parks Committee and presented the Raven Rock proposal. The project was unanimously endorsed, and the Division of State Parks was directed to initiate a feasibility study. On July 16, 1969, the Raven Rock Preservation and Park Committee, was incorporated as a non-profit organization to assist the State Government with the establishment of a state park at Raven Rock. Just prior to the organization of the Preservation Committee, State Senator William W. Staton introduced Bill # 495 in the State Senate (April 18, 1969) to establish Raven Rock and a surrounding area of some 3,000 acres near Lillington as a state park. Staton also handled the bill when it was referred to the committee on Conservation and Development. This committee gave the bill a unanimous favorable report and since the rules called for an appropriation, the bill went to the Committee on Appropriations. Officially launched by an appropriation of $120,000 from the General Assembly, Raven Rock received an additional boost of $62,500 from the Department of Conservation and Development. Matching funds from the Bureau of Outdoor Recreation brought the total moneys available to $365,000. The Government matched the appraised value ($57,500) of a 170 acre tract of land donated by Burlington Industries within the park area, bringing the cash potential in sight of $442,500. Approximately $477,500 was left to be obtained from private gifts and other sources to complete the $900,000 project as envisioned in the bill originally presented to the Legislature. Approximately 3,000 acres were being sought for the park area. There were eight separately owned tracts of land on the south side of the river and ten on the north side. The Council of State and Governor Scott approved the use of state funds for purchase of the 221.7 acre J. C. Cummings tract on February 6, 1970. The land was purchased and the deed was submitted to the Governor on March 23, 1970, during a celebration ceremony held in Raleigh, North Carolina. This was the first tract of land purchased with state funds to establish a state park since 1915. Burlington Industries donated a 169.4 acre tract to the park, and the Raven Rock Preservation and Park Committee purchased another tract consisting of 156.9 acres. Later that year, the Lizzy McKay tract was purchased, thus completing the first phase of acquisition. Additional tracts have since been purchased, bringing the park to its present size of 4,694 acres. Raven Rock has a diverse topography. Along the river are high bluffs and low floodplains. Some of the largest trees in the park are found in the floodplain where common species include river birch, beech and sycamore. The river bluffs and cool, moist ravines are home to mountain laurel and rhododendron, as well as elm and red maple. The flat, dry uplands are characterized by pine and oak/hickory forests where sourwood, dogwood and blueberry comprise the understory. The many streams of Raven Rock create an ideal habitat for aquatic invertebrates and fish. Salamanders are particularly at home along the river bluffs. The Piedmont forest is home to many reptiles. Spotted turtles live in small streams and larger turtles, such as the yellowbelly slider and the snapping turtle, are found in the river. Lizards such as the Carolina anole, fence lizard and skink also inhabit the forest. Among the many harmless snakes found in the park are the northern water snake, rat snake and the eastern hognose snake. Though rarely encountered, the venomous copperhead also resides in the park. Exercise caution when on park trails. The spring migratory season brings many species of birds to the park. At the peak of the season, it is possible to see as many as 20 species of warblers in a single day. Wood ducks nest in hollow trees along the river and many other species such as hawks, owls and woodpeckers are also found. Mammals in the park include white-tailed deer and eastern cottontails. Weasels, raccoons, mice and shrews inhabit the woodlands while beavers and muskrats are at home along rivers and creeks. Several species of bats may be seen as they hunt for insects. North Carolina Division of Parks and Recreation. Raven Rock State Park. http://www.ncparks.gov/raven-rock-state-park (accessed December 8, 2015). North Carolina Division of Parks and Recreation. Raven Rock State Park Master Plan. 1974. https://archive.org/details/ravenrockstatepa00unse (accessed December 17, 2015). Motessi, Gabriela; North Carolina Wildlife Resources Commission, et al. Raven Rock State Park Aquatic Inventory. September 1, 1997. http://digital.ncdcr.gov/cdm/ref/collection/p16062coll9/id/216860 (accessed December 17, 2015). 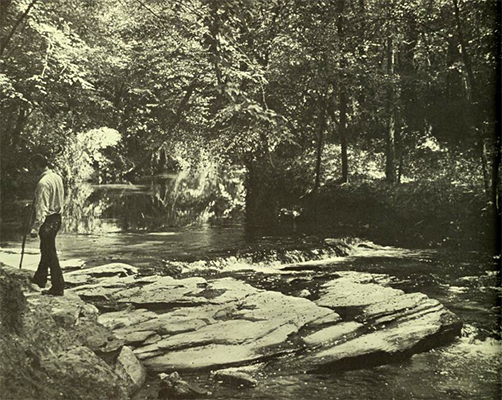 Resources on Raven Rock State Park, North Carolina Digital Collections. http://digital.ncdcr.gov/cdm/search/searchterm/raven%20rock%20state%20pa...? Cross, Jerry L. 1983. Raven Rock State Park a historical overview with emphasis on the southern portion. North Carolina Division of Archives and History, Research Branch. Raven Rock, vertical file, N.C. Government & Heritage Library.